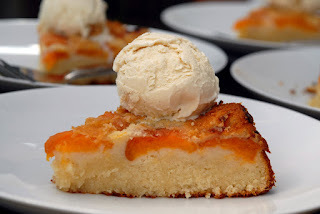 A rather yummy apricot (cos they are in season) upside down cake served with real dairy vanilla ice cream. Not terribly pretty but very nice. (And yes I scoffed the rest by Saturday night girls lol). Ok should I show you a card? It was Sunday yesterday and that means one thing , there is a new challenge posted over at SWUS and this time is Christmas. I really need to start on Christmassy makings but here is my first effort, pretty simple one to ease me in nicely and steadily. 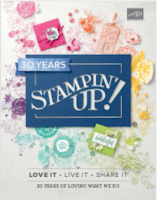 Certainly Celery, Real red and Chocolate Chip, Snow Flurries stamp set and Big Deal alpha,the pudding was made with the 1 3/8" circle punch and the scallop circle punch. And check that new twill ribbon out, it ties heavenly, I love it!!! OMG I'm still drooling over that cake Monica! I don't care how it looks - it's all about the taste LOL! 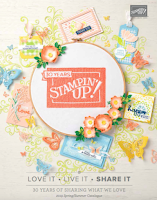 What a fab crafty get together you had with fab weather too - I'm jealous! Love your Xmas card but dunno if I'll get around to starting mine before Dec! 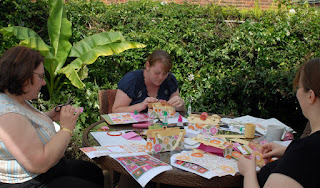 What an idillic scene in the garden, great company, good weather, yummy cake and crafting. Who could ask for anything more - NOT ME. Oh my yummy doos that cakey look scrummy!! I love the Christmas Card - I Love the little Christmas pudding - It's great. I meant to ring you back earlier.. about the cake... can I cancel it please? Carley has just found out that the manager at work has managed to get a friend of hers to make one.. would have been nice to have been told eh?! Wow I'd have come just for a piece of that cake! Hope you & your ladies had a fab day. oh my Monica that cake! WOW! I could almost taste it from here, and yes my goodness it IS pretty! Your garden looks fab as well. Looks like you all had a great time! If there was no ocean seperating us, I would have been at your stamp event. The scenery, the cake and the beautiful creations who could resisit. 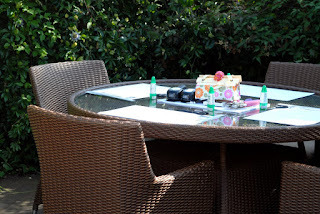 Looks like you had a fantastic class there - how lucky to have nice weather and craft outside. The cake looks delicious - Yummy indeed! Lovin' the xmas card, the snow flurries set is really nice. Looks like a great time!! 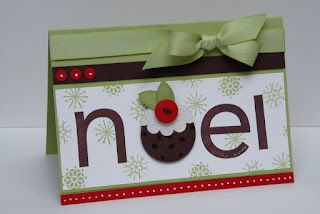 That Noel card is awesome and that cake looks yummy!!!! Yummy cake!!! Love the idea of Certainly Celery for Christmas!